I’m pleased as punch right now. I have a new blouse with sleeves. Woven sleeves! If you could have peeked into my closet prior to this you would have found only one woven sleeved garment. A lone oversized men’s button up that I wear to hide my arms from sunburn doing yard work. I have larger arms and RTW items with woven sleeves have never fit me nicely so I’m into the habit of not even considering them. Thus my wardrobe is full of sleeveless tops and knit cardigans/sweaters/shirts. 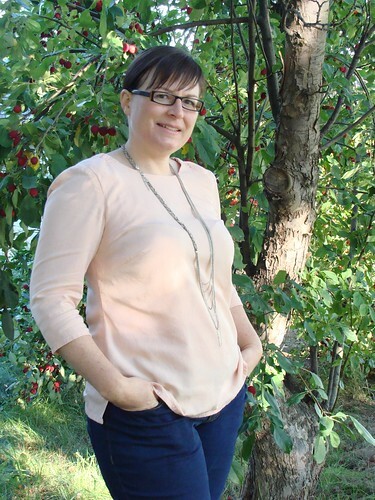 It took the release of the Everyday Blouse, designed by Rachel of House of Pinheiro, with its unique and appealing design details to nudge me into attempting a woven blouse with sleeves. I’ve never seen a pattern quite like this. 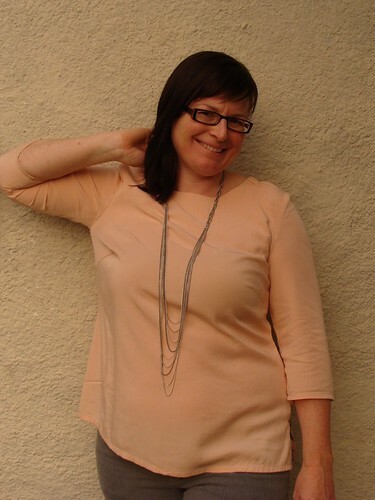 The little gathered elastic casing section at the neckline is so easy to add and looks amazing. I love how a simple technique like this combined with the exposed zip takes the top from ordinary to unique. Also, elbow darts! “Umm, what the heck is up with that?” is what I was thinking when I first saw them. Then I saw the shaping when I put on the top! The sleeve curves so nicely with the natural hang of my arm. Beautiful. The fit of this blouse came out very nicely. I had a brief moment of thinking it was to small the first time getting it on/off but once it’s on I love the minimal amount of ease and I wouldn’t change the size next time. It has an all in one facings too so the neckline is perfect and the facings don’t flip out or bunch up. I knew before starting that I would likely need to adjust the sleeve width so I looked up a few tutorials on this adjustment and ended up following this tutorial but widening all the way down. I measured at different points on my arm and compared to the finished bicep measurement stated in the pattern. 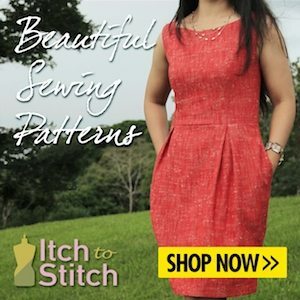 I love when a pattern has detailed final garment measurements like the bicep width, neck to hem length and sleeve length this one included! I also measured the lower arm on the pattern piece and with that decided to add 1″ of additional width all the way down. 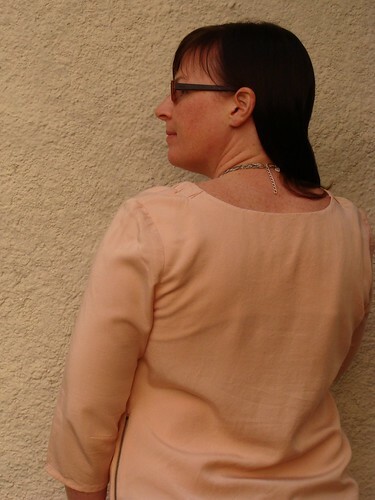 Now having worn my blouse a couple of times I think next time I may add another 1/4-1/2 an inch sleeve width. No wonder RTW sleeves don’t work for me! I did my standard adjustments for my 5’2″ short torso, shortening the bodice and sleeves by 1″ using the provided lengthen/shorten lines. After that was sorted out, it was time to decide if I needed to make a full bust adjustment. Nowadays I’m a D cup and trying to sneak by without an FBA just doesn’t work anymore. The pattern did not state the cup size designed for, bummer, so I just assumed it was B cup since that’s the norm for most patterns. I made a FBA of 1″ to go from a B to a D cup and this seems to have worked very nicely so I think guessed right. This is my first time adding an exposed zipper to a garment and I wasn’t completely clear on the technique just using the pattern instructions. I used this great tutorial which has lots of step by step photos. I’m really proud of this zip, even though it’s not completely perfect. 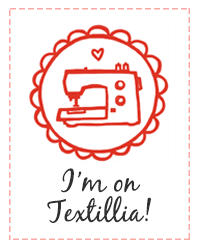 Learning a new skill always makes me happy! My only uncertainty in the end was if I should tuck in the zipper tails or leave them straight. Any exposed zipper experts reading this, what do you recommend? 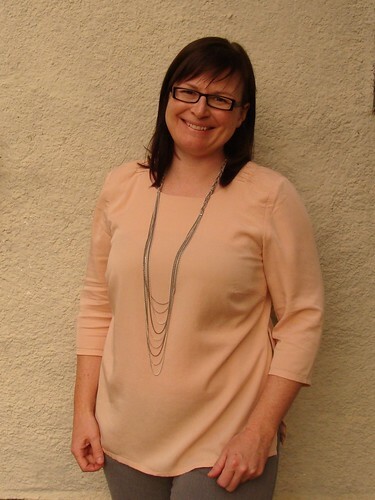 This blouse was a straightforward sew other than the zipper (being it was a new to me technique). The pattern is rated as advanced beginner. 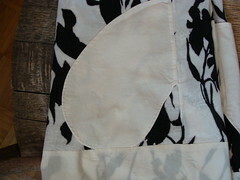 I thought the steps for setting in the sleeve and adding the zipper could have used a bit more detail for this level. The pattern instructions are complete but fairly concise at 4 pages long with 24 illustrations for the 32 steps. Not that you should let this deter you if you are a beginner and haven’t tried these techniques though. We live in the age of the internet with zillions of tutorials for everything and this is a well drafted pattern with unique details that are worth the extra research. I’m quite clearly a fan of ultra detailed instructions, which never assumed a technique is already known, but I recognize how this type of instructions could be annoying to some. This pattern had a section with “abbreviated sewing instructions” for use by more advanced sewists who do not need or want more detailed/hand holding type instructions. I think a summary like this is a fantastic idea to save experts from reading through details of techniques they already know. 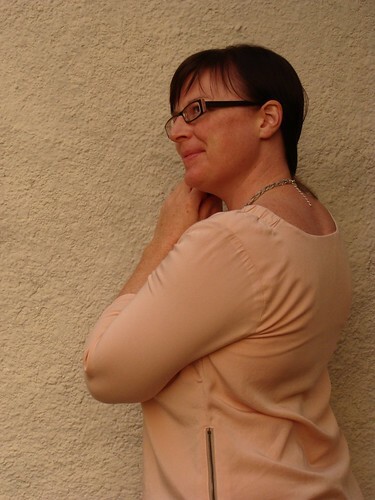 For this blouse I used a lovely blush tencel/viscose twill that I got from Blackbird Fabrics during a remnant sale earlier this year. While they no longer have the blush in stock they do have other colours still available. 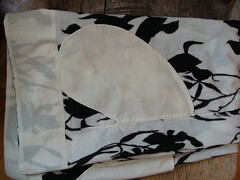 This material does wrinkle really easily but it is lovely and soft with great drape. This tencel and tencel/viscose twill is becoming one of my favourites, I’m a sucker for the soft brushed feel and it works nicely with tops or bottoms. Now that I’ve discovered the adjustments I need are so easy, I suspect this won’t be my last woven blouse with sleeves! To conclude my rambling here are some “real life” photos of me in my new blouse. 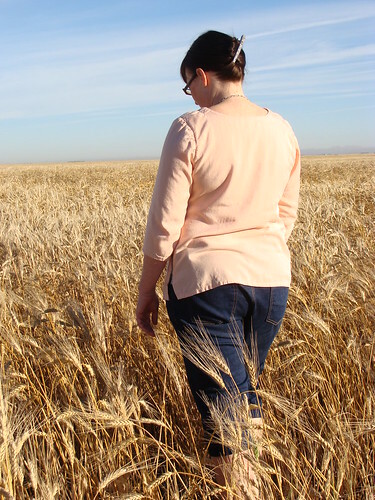 I mean who doesn’t get dressed up to wander through a wheat field? Haha. I think the gain fields and trees with ripe fruit are so pretty at this time of year. A great backdrop for my beautiful new blouse! I’m very happy to have been included in the “reader reviews” over at House of Pinheiro. Pop over to see more gorgeous examples of this pattern! Size Medium graded to Large at the hips chosen based on my measurements. 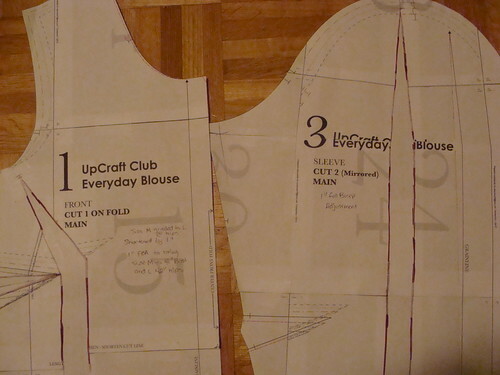 Shortened bodice and sleeves by 1″. Did a 1″ Full Bust Adjustment. Did a 1″ Full Bicep Adjustment. 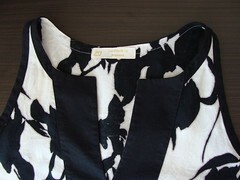 Unique design details (elastic casing at the side neckline and an exposed zipper) and a fit without excess ease. Would have liked more details/illustrations for how to insert the exposed zipper. I’m really pleased to hear that, based on our feedback, Rachel is planning to do a tutorial with lots of pictures and will update my post with a link to that once she has it up on her blog! I really love the modern fit and the design details of this pattern and it’s well drafted. I found the fabric requirements/recommendations accurate and the instructions complete, though I would have liked a few more illustrations of how to insert the zip and set the sleeve, given the advanced beginner skill rating. While the pattern did not state bust size designed for, it did have great final garment measurements and adjustment lines to assist with fitting. I’m extremely pleased with the fit I achieved making standard for me adjustments. I’ll certainly make this pattern again since it can be dressed up or down so easily! Just widen the sleeve a tad more, everything else seemed perfect! I love the elastic around the neck band as well. This is so cute on you! 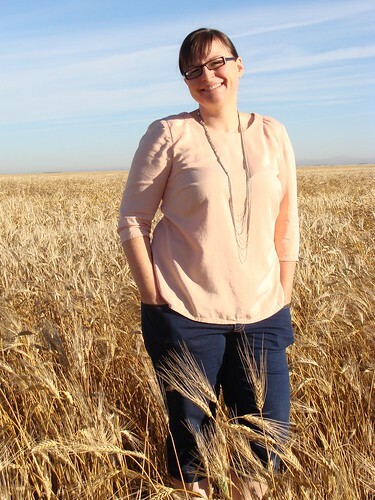 And yes, the Sask wheat makes the photos! Thanks Lena! The elastic is a great detail, so easy yet I never would have though of it on my own. 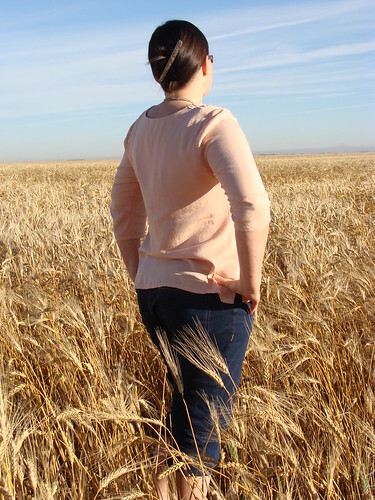 If only our pretty Saskatchewan fall lasted longer before snow came!